WHAT HAPPENED: One point could have changed it all. And because of that one point, it looked like the tallest Grand Slam quarterfinal in the Open Era was going to become the longest night in US Open history, too. No. 28 Kevin Anderson, after saving five set points in the second-set tiebreak, had four balls that he could have put away to turn a 1-6 deficit into a 7-6 lead and an opportunity to serve out the breaker for a two-set lead over No. 17 Sam Querrey. But the South African simply could not put the point away. Not with a swinging volley. Not with a forehand volley. Not with an overhead smash. And with a stiffly-pushed forehand volley long, he relinquished a golden opportunity to wrestle all momentum away from the American and his vocal late-night Arthur Ashe Stadium crowd. While Anderson did eventually earn a set point, it felt like everything was going Querrey’s way when the Californian evened the match at a set apiece, 11-9 in the hour-long set. But Anderson found a way to recover from that disappointment to oust the home favorite, 7-6, 6-7, 6-3, 7-6 in three hours, 26 minutes. The 31-year-old South African, who also had been up a break in the second set, looked for all the world like he would gain a nearly insurmountable lead in front of the fans who stuck around after an electric women’s quarterfinal in which No. 9 Venus Williams beat No. 13 Petra Kvitova. But after Querrey sent the remaining crowd to its feet, it became a question of if Anderson would be able to recover. It all could have snowballed when Querrey held a break point in the opening game of the third set, but the American could not convert. And it was actually Anderson who broke through in the sixth game of the set, forcing an error to gain the lead. There were no breaks of serve in the fourth and final set, as the match creeped closer to 2:00 a.m. local time. When Querrey hit an unreturned serve down match point at 5-6 in the tiebreak, anything could have happened. Yet Anderson showed no signs of tightening up, maintaining the aggression - he hit 67 winners in the match to only 45 unforced errors - which propelled him to that spot in the first place. Querrey earned a set point to force a decider, but Anderson’s baseline power was simply too much, forcing a slice into the net. At 1:51 a.m., a shot sent long by the American ended the evening, sending Anderson to his first major semifinal. By the smallest of margins, it was the 6-foot-8 underdog who stood tallest. September 5, 2017 - Sam Querrey in action against Kevin Anderson in a men's singles quarterfinal match at the 2017 US Open. 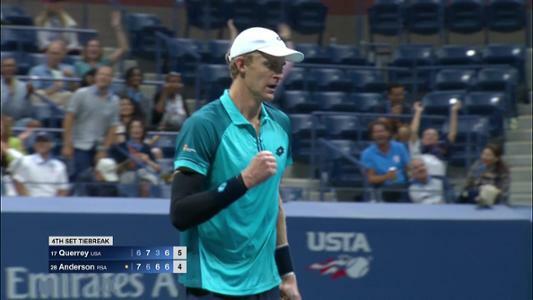 September 5, 2017 - Kevin Anderson in action against Sam Querrey in a men's singles quarterfinal match at the 2017 US Open. September 5, 2017 - An official checks the height of the net during the men's quarterfinal match between Sam Querrey and Kevin Anderson at the 2017 US Open. WHAT IT MEANS: Anderson became the first South African to reach a Grand Slam semifinal since Wayne Ferreira did it at the 2003 Australian Open, and the first from the country to make that deep of a run at the US Open since ESPN commentator Cliff Drysdale 52 years ago in 1965. He won just eight games in his first and only previous major quarterfinal appearance, losing in straight sets to Stanislas Wawrinka in the 2015 US Open. The tournament's leader in aces - Anderson has 92 in five matches - will look to bring his power to the court on Friday against No. 12 Pablo Carreno Busta in the semifinals, in a rematch of a tilt against the Spaniard from earlier this summer at the Rogers Cup in Montreal. Anderson got the better of Carreno Busta in that match in straight sets, and has won both career meetings between the two. It is not that long ago that Querrey entered Wimbledon having gone 0-for-37 in attempts to make a Grand Slam quarterfinal. Now, he has made three of them. While Querrey could not become the first American man to advance to the US Open semifinals since 2006, when Hall of Famer Andy Roddick did it, the Californian has virtually guaranteed that he will achieve a career-high ranking, pending Anderson and Juan Martin del Potro's results the rest of the fortnight. MATCH POINT: Anderson has already played the best tournament of his career. Does he have what it takes to hit through the defenses of No. 12 Pablo Carreno Busta to make his first-ever major final?